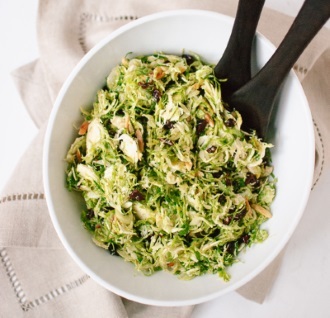 Combine Brussels sprouts and 2 tablespoons water in a medium microwave-safe bowl; cover. Microwave on 100% power (high) for 4 minutes, stirring halfway through. Immediately chill the Brussels sprouts by plunging into a bowl of ice water; drain well. Remove any excess moisture from the Brussels sprouts by using a salad spinner or place Brussels sprouts in a colander and use paper towels to absorb the excess moisture. Combine Brussels sprouts and apple in a large bowl. Pour Honey Yogurt Dressing (see below) over Brussels sprouts mixture; toss gently to coat. Add bacon; toss gently to combine. Cover and chill for 2 to 24 hours. Just before serving, gently stir in almonds. Honey Yogurt Dressing: Stir together Nonfat Greek Yogurt, SANE Honey, cider vinegar, and salt in a bowl. Chill up to 24 hours. * To trim Brussels sprouts, cut off the stems just at the spot where the leaves start to grow. Remove dark green outer leaves until the tender, light green leaves are uniformly exposed. ** To toast almonds, preheat oven to 350 degrees F. Spread the almonds in a shallow baking pan; bake for 5 to 10 minutes or until toasted, shaking pan once or twice.